Looking for the best red dot sight? We've got you covered with options for your AR-15, pistol, or any other long gun. Explore below to find our top picks for all budgets. To start, we'll give you our higher-end picks before moving onto some more affordable options. Continue reading to learn more about each choice, why we chose them, and find which is best for you. In terms of the value you get for your dollar, the Aimpoint PRO is the clear winner in my mind as the best red dot sight for the money. It's perfect for an AR-15, any other rifle, or even a shotgun. Known for their durability, reliability, and battery life, Aimpoint is the go-to manufacturer of red dots for military, police, and civilians. Priced at $441, the Patrol Rifle Optic is the most affordable way to get your hands on an Aimpoint. One of the largest factors separating Aimpoint from budget red dot sight manufacturers is their history of reliability. The U.S. military introduced the Aimpoint CompM2 as the M68 Close Combat Optic in 2000. Ever since then, Aimpoint optics have continuously proven to be extremely durable and reliable. Another major factor is battery life. The Patrol Rifle Optic is always on and can last for 30,000 continuous hours at level 7 (out of 10) brightness. That's nearly 3 and a half years on one 2L76 or DL1/3N battery! In the unlikely event your battery does die when you need it most, you can replace it easily without having to remove the optic from your rail. The 2 MOA dot is bright enough for use in any environment, even the sunniest days, and its lowest settings are night vision compatible for those who plan to use it for duty or nighttime competition. The dot is viewed through clear glass with a very slight greenish/yellowish hue. The PRO also has easily removable caps protecting the windage and elevation adjustments, along with flip-up lens covers at both the front and rear (clear cover). The only potential drawback to the PRO is its size. As you can see in the picture above, it takes up its fair share of rail space. If you're planning to put a magnifier behind it, like the Vortex VMX-3T shown below, it will be quite a tight fit. Including the battery, lens covers, mount, and spacer, the PRO weighs 11.6 oz. It's 5.1 inches long and 2.2 inches wide. It doesn't feel particularly heavy to me on my rifle, but those of you looking to shave off ounces everywhere may not be thrilled with its weight. My last piece of praise for the Aimpoint PRO is that it can be used in just about any conditions. It's submersible up to 150 feet and can function from -49°F to 160°F. It also does a fantastic job at holding zero under any hard use I've put it to. If you can afford the price tag and don't want to go any higher, this is hands down my choice for the best red dot sight for your rifle. The AR-15 pistol above (plus a weapon light not in the picture) is my home-defense setup and would also be my first choice if a zombie virus outbreak hits. Though the Patrol Rifle Optic should be durable enough for nearly any situation, Aimpoint does offer an even stronger red dot sight - the CompM5. Compared to earlier Aimpoint CompM models, the CompM5 has an added front window to protect the front lens. It's also made from stronger 7075-T6 aluminum instead of 6061. This is the same material used for AR-15 lower and upper receivers. Battery life is also better, at 50,000 hours at position 7. It functions at the same temperatures as the PRO and is also equally submersible, though it comes in a smaller package. The CompM5 weighs 8.4 oz and is 3.3 inches long by 1.3 inches wide. For those of you who need to be sure you're buying the strongest and absolute best red dot sight available, go with the Aimpoint CompM5. It'll cost you though... more than twice the price of the PRO. Whereas the Patrol Rifle Optic is on the large side, the Micro T-2 is the smallest red dot sight you can get that comes with Aimpoint reliability. It's 3 inches long by 1.6 inches wide and weighs just 4.6 oz fully configured. The battery life is also superior at 50,000 hours of continuous use at position 8 of 12. It can function at the same temperature range as the PRO, though it's only submersible to 80 feet... Sorry to those of you wanting to scuba with your rifle. Trijicon is best known as the manufacturer of the ACOG, RMR pistol red dot, and in my mind, the best pistol night sights. In 2015, they launched the Miniature Rifle Optic (MRO). Today, the MRO is the main competitor to Aimpoint's Patrol Rifle Optic. With a mount, the MRO is usually priced ever so slightly higher than the Aimpoint PRO. As the "Miniature" in the name suggests, the MRO is a lot shorter than the Aimpoint PRO at 2.6 inches (2.6" long by 1.7" wide). It also weighs just 5.9 oz with the battery and a lower 1/3 co-witness mount installed. Apart from its size, another thing that sets the MRO apart from the PRO is that its housing is made from 7075-T6 aluminum. This is the same material we praised Aimpoint's CompM5 for using. The MRO is able to operate from -60°F to 160°F and is waterproof up to 100 feet. Lastly, the battery life of the MRO is 50,000 hours at setting 5 of 8. So what are the drawbacks of the Trijicon MRO compared to the Aimpoint PRO? For starters, Trijicon doesn't have the same long-standing reputation for rifle red dot sights, though they have built a fantastic reputation for their other products. I haven't had any issues with my MRO, but I have seen a higher number of quality control complaints online with the MRO compared to Aimpoint products. The MRO also has less clear lenses, with a slightly blueish tint. In my opinion, this is a bit more obvious than anything with Aimpoint glass. It's not a deal breaker, but I prefer the PRO in this regard. Sticking with Trijicon, the RMR Type 2 is the red dot sight they're best-known for—so much so, that some people seem to use "RMR" for pistol red dots the same way people use "Kleenex" to describe all facial tissues. This is for good reason, as the Trijicon RMR Type 2 is our clear cut pick for the best red dot sight for pistols. It's another optic with a (relatively) long history of reliability, durability, and performance; the RMR has been used extensively in the line of duty and is used by the majority of top competitive shooters. The original RMR was introduced in 2009 and kick-started the ever-increasing demand for pistol red dot sights. The adjustable LED RMR Type 2, which we recommend, allows you to manually adjust the brightness level of the sight. After 16.5 hours, it kicks back to an automatic mode which automatically adjusts the brightness based on your environment. There are 8 available brightness settings and the battery lasts up to 4 years at level 4. Unfortunately, the sight needs to be unmounted to change the battery since it's on the bottom of the RMR. You have the option to purchase an RMR Type 2 with one of three different dot sizes—1 MOA, 3.25 MOA (most common), or 6.5 MOA—I'd personally avoid the 6.5 MOA. Unlike AR-15s that almost always have a Picatinny rail, there's no standardized optic mounting system on pistols. Unless your pistol was designed to use a red dot from the manufacturer, your best bet is generally to buy an aftermarket slide. Fortunately, because Trijicon's RMR is so incredibly popular, you should have no issues finding slides with mounting plates made for it. The RMR Type 2 is 1.77 inches long and weighs 1.2 oz with the battery installed. If Aimpoint and Trijicon optics are out of your price range, then the Holosun HS403C is what we would recommend for an AR-15 or any other long gun. Priced at $199.99, it just barely makes the cut as the best budget red dot under $200. Holosun is known for its dual-powered optics that operate off of both solar energy and batteries. The HS403C is one of these optics. In many lighting conditions, the HS403C can run without a battery. However, it also has a backup battery which Holosun claims can last up to 50,000 hours. Unfortunately, I can't find any details as to the specifics of its battery life (like how many hours on setting X), so take that number with a grain of salt. With any red dot you plan to use for self-defense or duty, it's always a good idea to swap out the battery at least every year or so. So long as you don't keep the HS403C on at the highest settings in low lighting conditions, it should easily last you a year on one battery. By default, the HS403C automatically adjusts the brightness of the dot to the lighting of your surroundings, but you can also put it in a manual adjustment mode when using battery power. It's one of the smaller red dot sights on our list at 2.44 inches long and weighs 4.3 oz. Now for some of the downsides of this option. Naturally, not everything is perfect with something this affordable. For starters, the 6061 aluminum housing feels sturdy enough for most use cases, but it's not as strong as some competitors. This has been echoed from what I've seen reported in various drop tests. The included mount is a particular weak point in my opinion. With that said, it does come with mounting options for either a lower 1/3 or absolute co-witness. Though my HS403C has performed well since I've had it, there definitely seem to be more quality-control issues reported in online reviews compared to some of the higher-end options listed above. These include both issues with brand new HS403Cs fresh out the box as well as issues that present themselves over time. So should you use the HS403C for serious use? I'd always recommend a red dot over no optic at all. If you can't afford the higher-end options, the HS403C is the best red dot sight under $200, but be ready to rely on your backup sights just in case. The HS403B is an even more affordable version of the above Holosun red dot sight, without the ability to use solar energy or automatically adjust its brightness level. Instead, it's entirely reliant on battery power. This red dot automatically shuts off after 8 hours of no movement but can turn back on with any sensed movement. It's a cool feature to save battery life, but it's another thing that could go wrong if it fails to work when you need it most. We generally prefer red dot sights that are always on. I'm a HUGE fan of Vortex. They make a mix of low-, mid-, and high-end optics that are all priced very well for what you get. They also offer an incredible no-questions-asked lifetime "VIP" warranty. One of their "lower-end" optics is the Crossfire red dot sight. When I say the crossfire is "lower end", I'm referring to a lack of features, not the quality of the product itself. Its glass is quite clear, especially for its price, and the 2 MOA dot is plenty bright. The battery life is 50,000 hours at medium brightness out of its 11 settings, plus I like that you can turn the red dot off from any of the 11 settings, rather than needing to go all the way to the lowest setting. Considering that it's often priced in the low $100s on Amazon, it's a great option for a cheap red dot sight for casual shooting. It lives on my lightweight range rifle. Vortex also makes a very affordable pistol red dot reflex sight - the Venom. It offers automatic brightness controls, including an auto-off feature, and you can purchase one with either a 3 MOA or 6 MOA dot size. The CR 1632 battery that powers the Venom can last 30,000 hours on the dimmest setting and 150 hours on the brightest setting. All in all, it's an incredibly small reflex sight (1.9 inches long) that's perfect for those that want a red dot for their pistol, without the price of a Trijicon RMR. It also comes with a Picatinny mount for easy rifle mounting. Now for something a bit different than what we've covered so far. Though not technically a red dot sight, actually a holographic sight, we figured we'd cover it while we're talking about Vortex optics. Be sure to check out Amazon, because we've seen them priced significantly cheaper than Brownells in the past. Vortex is the first manufacturer to rival EOTech with a true holographic sight. It was hard to get a well-focused picture, but the reticle features a 1 MOA dot surrounded by a 65 MOA diameter circle. This allows for incredibly fast and easy target acquisition compared to a traditional red dot sight... It also makes you feel like you're playing a video game. However, all of this awesomeness comes at a cost—and I'm not just talking about the price. For starters, the UH-1 is big and fairly heavy at 11.8 oz. It looks like a brick on my AR pistol compared to some other optics on our list. Battery life is also a big issue that doesn't just plague this holographic sight, but all of them. It's estimated to last just 1,500 hours. On the plus side, unlike other holographic sights, the Huey's battery is rechargeable. It will also start pulsing when the remaining battery life is low, which is a nice feature. But what if you want more than just a red dot, without the short battery life? This brings us back to Holosun. Their HS510C has a "Multiple Reticle System" which used LED technology to power both the dot and circle surrounding it. Though it's not a holographic sight, it does give you the same style of reticle. What's really cool is that you can choose to turn off the circle surrounding the red dot if you wish. The HS510C offers the same solar-powered technology as the HS403C and has the same maximum battery life. Last on our list is the Bushnell TRS-25. It's the cheapest red dot sight that we can somewhat get behind. Priced well below $100, the TRS-25 actually has pretty decent glass clarity, though looking down the sight feels claustrophobic. It does not come with any riser mount, but you can also pick up a UTG Short Riser Mount and keep your total purchase below $100. Though I would not recommend this setup for anything serious, it's serviceable for some casual range shooting. We've covered all of our top picks for the best red dot sights, but which is best for you? If you can afford it, we recommend the Aimpoint CompM5 for AR-15s or other long guns. Alternatively, the Aimpoint PRO and the Trijicon MRO are fantastic options for serious duty or self-defense use at a more affordable price. Holosun's HS403C and HS510C are even more affordable options with some cool features, though we're not as confident in their reliability and durability. As far as pistol red dots go, Trijicon's RMR Type 2 is the best available option, but the Vortex Venom is a fantastic budget alternative. 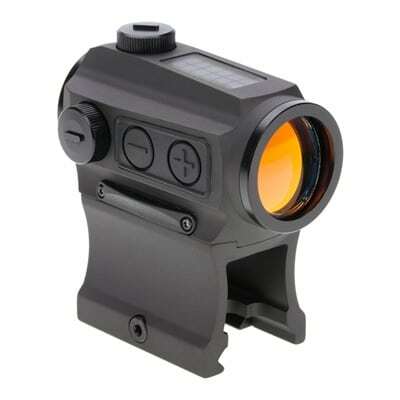 Finally, for ultra-budget red dot sights for range plinking, there's the Vortex Crossfire or even the Bushnell TRS-25.